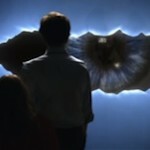 Here are a few thoughts on the ideas at work in The Eleventh Hour, the first episode of the 2010 season of Doctor Who. It’s not a straight ‘review’, because there are enough of those on the internet already. But it’s also not the type of researched essay you expect from this site, because I’m interested in the episode’s ambiguities and the thoughts circulating in my head after seeing it, and don’t want to re-watch the episode to death or wait until the end of the season when some of those ideas will have been resolved. This piece will discuss the ideas relating to the ‘storybook quality’ that new lead writer Steven Moffat has talked about3, think about how style and imagery support characterisation and theme, and work out why my mind has made associations with the classic Michael Powell and Emeric Pressburger film A Matter of Life and Death (1946). This piece contains spoilers, and, unlike other essays on this site, you will need to have seen the episode to know what I’m talking about. Moffat’s previous Who scripts have been seen as ‘darker’ stories than usual, rife with depth and metaphor.4 However, The Eleventh Hour is his first attempt at an Episode 1, which is traditionally a ‘more of the same’ romp – whilst also underlining the new era’s differences. Bags of fun, The Eleventh Hour also displays a consistency of theme and imagery, achieving that tricky ‘post-regeneration-trauma’ story (there have been some stinkers) by anchoring it through a concern with identity. The best monsters, in myths and literature5 or Doctor Who, make manifest the themes of their narratives or wider social concerns from class to gender. Moffat’s previous Who stories are no exception: take the gas mask zombification in The Empty Child which makes literal the rootlessness of post-war children amid the rubble and British identity’s stultification in regressive wartime iconography, or the Clockwork Men of The Girl in the Fireplace who simultaneously echo the Doctor (hollow men of time with clock faces) and underline the relationship imagery at work: masks which hide faces (which are the masks we wear). Equally, while admiring The Eleventh Hour‘s creepy personification of Prisoner Zero in one man and his dog – ‘bizarre scenes where you can have a dog and bark yourself’6 – and the mother and daughters, there are concerns that reflect the Doctor’s position: an attempt to assert identity, to find a voice, to separate (as the Doctor later does from that montage of old Doctors faces, ultimately stepping through the face of the previous Doctor to assert that he is the Doctor now). The manner of the interplay between dream and reality is one of the parallels I felt with A Matter of Life and Death, which as per convention I’ll call AMOLAD. I’m not claiming it as an influence, just noting devices and images in common: they both open with the male lead character crashing, both have a male/female relationship (with the woman in uniform) rooted in tensions between reality and fantasy, eyeball imagery related to ideas of ‘vision’ (both connected to Doctors making long-distance diagnoses over a village), the idea of playing with time (again connected to vision) and creative agency battling determinism. 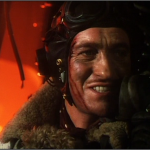 In AMOLAD, we first see Peter (David Niven) in a plane that’s about to crash. He has no parachute and cannot escape, introducing determinism (events being decided by forces beyond our control). Peter’s response is to think of loved ones and quote poetry – he says he would rather have written like Raleigh than to have flown through Hitler’s legs. (Rather than flying through Hitler’s legs, the Eleventh Doctor narrowly avoids avoiding damaging what’s between his legs on the top of Big Ben8.) Peter accepts his imminent death and jumps without a parachute, as if asserting his agency (people can assert their free will). 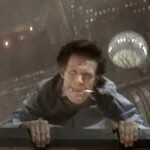 The Doctor tried the no-parachute jump in The End of Time Part 2 to confront the Master and Rassilon (his rage towards the end of the era was in response to the idea of events being beyond his control, not least the suicide in The Waters of Mars), and The Eleventh Hour confirms the ‘Fall’ (not from innocence but from the godlike status which Davies conferred upon the Tenth Doctor in several stories). As in the Fifth Doctor’s first story, Castrovalva, the Doctor’s regeneration depends on shedding a previous season’s determinism to assert free will. This raises a question toyed with in the episode: how far is what happens down to Amy’s perception? (Like Peter, the Doctor after his crash first discovers a child.) The smooth transition from title sequence to drama in a graphic match between time tunnel and a swirling fan gives a smooth storybook quality, and the opening tracking shot echoes Tim Burton in visually announcing ‘once upon a time’ (while suggesting a more stylised form of storytelling), but also integrates the Doctor with Amy in a way that’s even more striking as we see the child Amy all-but wish the Doctor into existence. (What brings the Doctor to Amy, and his ulterior motives in travelling with her, are troubling questions set up in looks and edits, to be resolved later in the season.) As Neil Perryman observes, the red of the fan gives way to the ‘darker, colder blue’ colour ‘palette’, just as we shift from ‘grandstanding spectacle’ to ‘a solitary child’s voice and a spooky undercurrent’10 We plunge straight into the iconography of fairy tale. By contrast, the first episode of this relaunched series, Russell T. Davies’s Rose, vitally established an everyday world (which some fans lazily and inaccurately called ‘soap’), and Rose as an everywoman and empathy figure, to be shaken up by the Doctor’s arrival. Rose staked Doctor Who’s claim to join the existing televisual landscape, for people who did not know what it did: although The Eleventh Hour does the same in character terms (new viewers learn about the Doctor through Amy), the genre markers show how far Davies groomed the Saturday night audience. Introductions to Rose, Martha and Donna were ‘encouraging rather than defying the audience to gain some perspective on them, and then presenting us with mystery’,11 while Amy has an odd backstory full of gaps, which make her part of those genre markers or, perhaps, the genre markers part of her identity. We’re learning about the Doctor and Amy simultaneously. But first, like Russell T. Davies, who superbly raised questions about the impact of regeneration (‘New teeth… that’s weird’), Moffat produces a fast, funny sequence of the Doctor working out what he likes to eat, an early grappling with identity. However, we are more concerned with the spooky crack in Amy’s bedroom wall. It’s an appropriate image to accompany the Doctor’s arrival, given Matthew Kilburn’s argument that ‘that crack in the wall is Doctor Who, coming into our cosy teatime lives with disturbing themes, and waiting for us in our imaginations at night’12 John Williams argues that the Doctor’s deduction – that it’s actually a crack in the universe – ‘is both a brilliantly Doctor-ish and childlike diagnosis. It’s the opposite of Occam’s razor, and exactly gets the characteristically solipsistic way that a child views the world… the Doctor is partly to be a child’13. Wall imagery is vital to new Doctor Who. In the emotional climax to Davies’s Doomsday, a white wall symbolises the seemingly final separation of the Doctor and Rose; in Davies’s The End of Time a small cabinet (as fans put it, ‘the Wrath of Khan death box’) fatally imprisons the Doctor, an oddly disturbing end for the Davies era, given Davies’s statement that the sonic screwdriver and psychic paper were devices to get past the locked doors and times in cells that slowed down old Who. 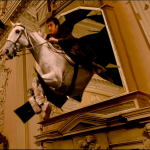 In Moffat’s work, walls are more mutable.14 Unlike the later Doomsday, the Doctor and Rose can breach walls in The Doctor Dances, while The Girl in the Fireplace is full of doors and walls between times and places, culminating in the Doctor’s horse-jump through a mirror. 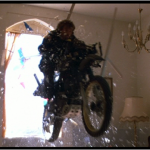 ...Chuck Norris arriving to have words with a terrorist in The Delta Force. The Eleventh Hour even signposts connections, as the Doctor steals a line from The Girl in the Fireplace as he looks at Amy’s wall: ‘You’ve had some cowboys in here’. He turns it into a joke (‘Not actual cowboys, though that can happen’), but if we remember that episode, it’s slightly disturbing: when he said it to Reinette, he was looking into Reinette’s mind. Is he somehow inside Amy’s mind/world now? The melded spaceship/France setting of Fireplace constitutes ‘time as place’ and ‘place as time’. The Eleventh Hour has echoes of this in the combination of wall-breach and the Doctor’s timekeeping, and the Doctor making Amy see the door (of perception) that she has lived in ignorance of for years – but which for him, and us, follows on a linear narrative path. Young Amy’s wall also introduces the eyeball motif which runs through the episode. The eye peering through the wall brings to mind the fourth-wall-shattering impact of Carnival of Monsters, the realisation that the Doctor and Jo are in a reality-TV-like peepshow exhibit, the collision of realities as a hand reaches into the fiction. But there are wider ideas which again merit comparison with AMOLAD. 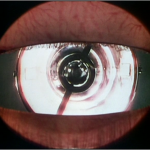 There are several pieces of eye imagery in AMOLAD: a gaze down from Heaven through a circle, a point-of-view shot inside Peter’s eye in the operating room, and a scene in which Dr Reeves uses a camera obscura to diagnose patients around the village. The first and last are associated with authority figures, with knowledge and judgement (in the episode, judgement awaits Prisoner Zero). Taken together, you have vision in both its senses: vision as in sight and vision as in personal vision, creation: Dr Reeves says that June, via the camera obscura, sees everything clearly and all at once like a poet. Peter quoted poetry earlier, so his ‘vision’ relates also to creative ‘agency’, his ability to create, invent, dream, as an individual.16 We’re left to consider the relationship between Amy’s vision, and dreams, with the story as it unfolds, ideally stopping short of not destroying the experience in over-analysis (she’s called Amy Pond, there’s a duck pond without ducks in it – hmm, is she too an ‘empty Pond’?). The Atraxi ship, with its eyeball design, is one of the issues the series will return to. 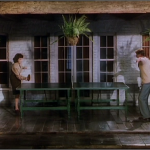 But the idea of creative vision is vital to this episode, which typically for Moffat explores, according to Frank Collins, ‘the inner fantasy lives of children’, and Amy in particular, a woman who ‘grows up and sadly disconnects from her own inner child’.17 As in AMOLAD, there is a thin line between seeing and imagining: Amy has spent her youth being psychoanalysed precisely because she is unsure whether she saw the Doctor and TARDIS or imagined them, created them just as she effectively asked Santa to conjure them up at the start and played games with them through stories, fantasies and home-made toys later. As in Rumpelstiltskin, a fairytale creature defeated by naming, the cure for her ills seems to lie in identity. Staring into eyes convinces her of danger (Prisoner Zero and its pursuers) and the Doctor’s ability to respond, as in the scene in which she traps the Doctor in a car door by his tie, which collides so many ideas from the story: the Doctor trapped by the costume of his predecessor, the use of a door, and Amy needing to stop the Doctor moving, but doing so by trapping him to a usually moving object.18 We too delve into the Doctor’s eye at the start of the stop-motion sequence in which we see the Doctor’s photographic memory, and roam across the village looking for the detail he is sure he’s observed. 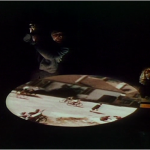 This recalls Dr Reeves’s camera obscura, but the switch in style also reminds me of the moment in AMOLAD when time stops during a table tennis game: film itself is playing with time – as in this episode, we wonder, as Philip Horne said of AMOLAD, ‘At times like this, as spectators, are we creators (putting the images together in our minds) or watchers?’19 That’s certainly a question to ask of Amy. All in all, this was a triumphant start to the season, mixing old (various fan sites have listed the repetition of story tropes from previous Russell T. Davies and Steven Moffat stories, or earlier Doctor Who stories, to which I could happily add Moffat’s characteristic references to his earlier Press Gang and Coupling) and new. There are few dramas in which a change of lead writer gets press attention, not only in listings magazines and newspaper media supplements but also the main news section of a newspaper like The Observer which observed that the episode was ‘the first for the show’s new creative boss, Steven Moffat, who has brought audiences some of the scariest episodes so far, including Blink and The Girl in the Fireplace.31 Newspapers have drawn the kind of improbable generalisations usually made by fans: ‘It’s a welcome relief after the absurd self-indulgence of the Russell T. Davies era, when the plots were unfathomable and David Tennant descended into slapstick’32. Will Moffat’s ‘era’ give more weight to plot? Mobile phones, laptops (is it significant that the laptop brand is ‘Myth’?) and conference-calls are present from the Davies era, although unlike Last of the Time Lords, what is broadcast is not belief in the Doctor leading to his messianic resurrection, but a succession of zeroes. The zeroes are probably not a sardonic comment like Alfred Hitchcock’s point that the ‘O’ in Roger O. Thornhill (in North by Northwest) stood for ‘nothing’. For those of us writing in fanzines two decades ago, such coverage was unimaginable, and yet we live in a world where the anti-Thatcher rhetoric of late 1980s Who is deemed worthy of a Newsnight feature, surely the only time Newsnight has been twenty years behind our photocopied fanzines. Last but not least, there is the sparkling interplay between Karen Gillan and Matt Smith, and almost unanimous praise for the new Doctor, a ‘young-old’ Doctor. If BBC executives were worried, ‘they can relax’ because ‘Smith is a revelation: a proper Doctor, with elements of both absent-minded Professor and schoolboy’33 Fans may have been worried, but they hardly count given the shocking revelation on forums in 2003-5 that some of them didn’t even know who Christopher Eccleston was, and seem blind to the idea that even a 40-year-old isn’t necessarily more convincing at being a 900-year-old than a 27-year-old is. One columnist said, ‘Thank God I can stop defending Matt Smith’ now everyone has seen him: ‘For the first time ever we understand what it must be like for the Doctor to inhabit an entirely new body’.34 In the previous Doctor’s first story (The Christmas Invasion) the Doctor too defeated an alien and stressed that Earth was defended, but did so through a sword fight and eventual killing with a Satsuma after giving ‘one chance’, which he attributed to the sort of guy he now is (revealing an arrogance that played out in the bleak finale to The Waters of Mars). By that token, and with the unresolved elements of The Eleventh Hour, it is clear that Smith and Gillan will be stretched more as performers once story arcs start to play out. Originally posted: 10 April 2010.